If it feels as though you are seeing road ribbons everywhere you go, you're probably right. Judging by the orders being placed and the photos participants are sending through to show their support for the campaign, road ribbons might be taking over the state. Since the campaign commended on Sunday, 19 November, more than 33,000 road ribbons have been distributed by at least 150 participating Local Governments, RoadWise committees, community groups, other organisations and individuals, through more than 60 events and displays. 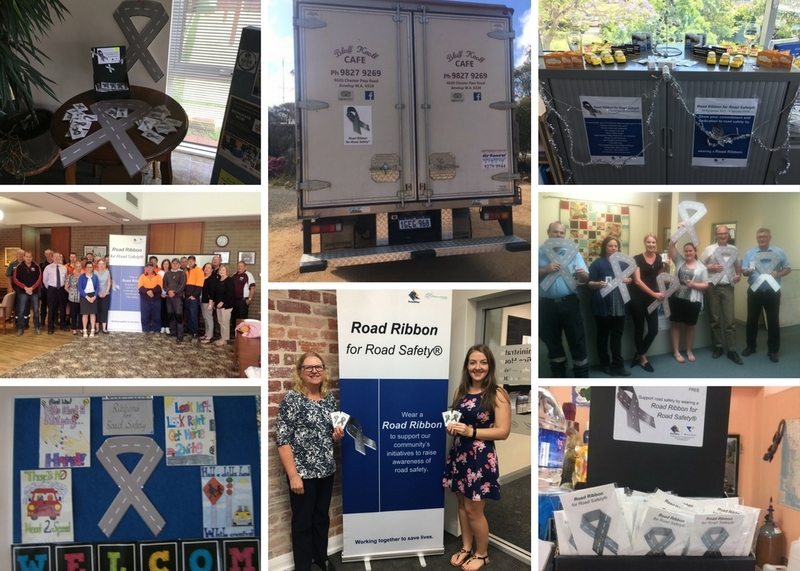 A full campaign wrap-up containing information on all the innovative Road Ribbon for Road Safety® campaign activities will follow next month. If you have any information, including feedback and/or photos from your campaign involvement, email Road Safety Project Officer, Essie Smith; esmith@walga.asn.au. Pictured above: Local Governments joining forces to promote the Road Ribbon for Road Safety® campaign across the state. For more information on the Road Ribbon for Road Safety® campaign, visit the RoadWise website; www.roadwise.asn.au/road-ribbon-for-road-safety.aspx.